Everywhere you look there are signs of spring and the promise of warmer temperatures and outdoor fun. The down side of warmer days are sweat stains on our clothes. While prevention is the best way to keep sweat stains at bay, the unsightly spots are inevitable for many of us. 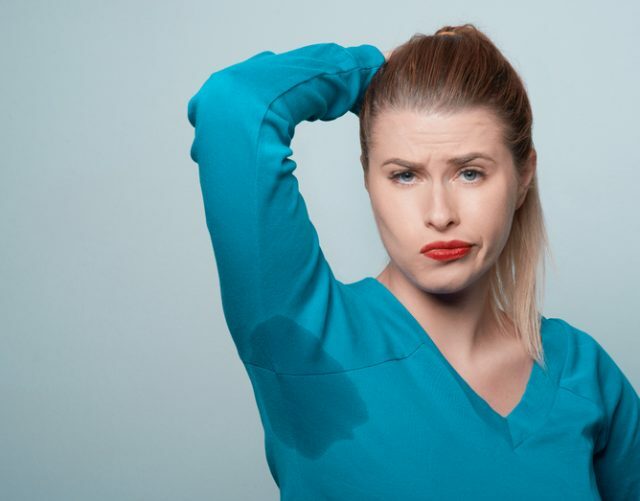 Sweating is a part of life and actually an important body process that helps keep us cool, but that doesn’t mean we have to live with the sweat stain aftermath. After all, there’s nothing worse than tossing on your favourite tee, only to notice the dreaded yellowing at the armpit. Step 1: Make a mixture of equal parts baking soda and hydrogen peroxide. Add a drop of Dawn Original dish soap and stir into a paste. Step 2; Apply by pouring mixture onto sweat stain and gently rubbing in with a small brush (I always use an old toothbrush). I also do this right on top of my washing machine but if you are using a different surface be sure to lay a white towel under to prevent discoloration to any other surfaces. Let the mixture sit on the clothes for at least 30 minutes (I try to lay them outside in the sun if possible). Step 3: Wash in cold or warm water depending on the care instructions and air or line dry (again, drying in the sun is even better!) You can try this method on light coloured clothing as well, especially if it is not colorfast, but it is best to test in a seam first to make sure you don’t damage the item. 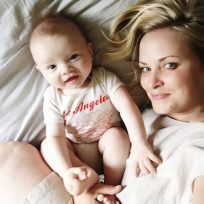 TIP: I use this method to remove almost any kind of stain from white clothing and it works like a charm, including yellowed, yucky spit-up stains! Step 1: In a sink or bucket, run enough cold water to submerge item completely, then add a cup of white vinegar. Step 2: Submerge clothing and let soak. Then wash as you normally would and line or air dry. Step 3: Repeat this method until stains are gone. You can also use this for lighter colorfast clothing. Treat the stain as soon as possible. Like any stain, the sooner you treat it the better. Read the care label on your clothing. Not all pieces of clothing or fabrics can be treated equally. If a clothing tag says “dry clean only” you shouldn’t treat the stain at home. Have a few lemons in the garden? Squeeze the juice into equal parts water, rub into stains & toss in the wash.
Never reach for bleach! Chlorine bleach can actually have the opposite effect by making sweat stains appear darker. Washing a shirt immediately after wearing it prevents pit stains from setting, helping your items to last longer. If you have white clothing that has yellowed in the arm pit area overtime due to sweat (which is really due to deodorants and antiperspirants), the above method for white clothing should work great here as well. You might want to let the mixture set longer and then be sure to air dry in the sun.